Believe it or not, Ithaca, New York has a deep history with aviation. If you live in or frequently visit Ithaca, you may be aware that our airport, the Ithaca Tompkins Regional Airport (ITH) has been in business since 2001, yet aviation in Ithaca and neighboring towns dates back to the early 1900’s. In fact, quite a few milestones took place prior to the start of ITH. 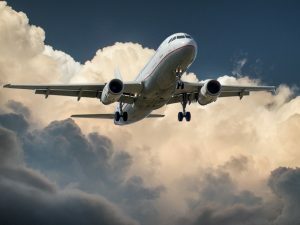 You may remember learning about the Wright brothers: the brothers known for developing and flying the first successful airplane, but they also inspired many people across the country to pursue aviation. Among those people were the students at Cornell University, who kickstarted aviation in Ithaca by creating the aeronautical club, which consisted of 80 members by the time the Wright brothers had achieved the first sustained powered flight in 1903. Ithaca’s second involvement in aviation occurred in 1914. During this time, the Ithaca Board of Trade recognized the potential in aviation development. 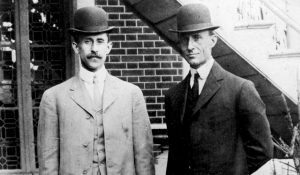 They acted on this motivation by inviting aircraft designers, William T. and Oliver W. Thomas or “the Thomas brothers” to Ithaca to set up an aircraft manufacturing plant. After the plant was set up, the area that is now known as Cass Park had hangars erected to facilitate aircraft operations. This began with a rail track at that site to launch float planes into the water. With the construction of land planes came an expansion of the “airport” into a landing strip. Late named the Ithaca Municipal Airport is believed to be only the second airport to exist in New York State. Towards the end of World War I, The Thomas brothers started the Thomas-Morse Aircraft Corporation with the financial backing of Frank L. Morse, who founded the Morse Chain Company. Their greatest success was the production of a single-seater trainer known as the S-4 series or “Scout” – a model of which hangs in a present terminal building. At this time, around 1,200 people were employed either in the Brindley Street factory or in the Morse Chain aircraft assembly annex up on South Hill. However, “Scout” was the only really successful aircraft to come out of the Thomas-Morse factory. In 1929, the Thomas-Morse Aircraft Corporation was bought up by the the Consolidated Aircraft Company in Buffalo. Today, a project has been received to bring ‘Tommy’ home by restoring it to flying condition with plans to fly it on its 100th birthday. The flight is planned for September 22, 2018. To learn more about the project, look here. The next step in aviation in Ithaca occurred in 1927 when Herbert “Pete” Peters used an existing wooden hangar at the municipal airport and several other single-engine aircraft and began offering charter flights and student instruction. By the beginning of World War II, Peters and his wife, Dorothy, had taken on the responsibility of flight training for Cornell’s Reserve Officer Trainee Corps (ROTC) program. The Finger Lakes Flying Service, owned by Alfred Cook and Richard Compton, eventually took over from Peters and operated the Municipal Airport until the early 1960s when the airport closed down, having been replaced by the new airport on East Hill – the present-day Ithaca Tompkins Regional Airport. In 1948, operations between Robinson Airlines, the airline that operated between Ithaca, Teterboro, and New Jersey, were transferred from the Ithaca Municipal Airport to ITH, which was then the East Hill Airport. 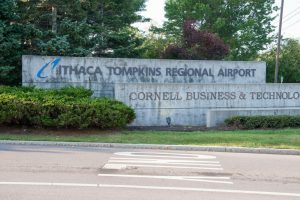 Since the County Board purchased the East Hill Airport from Cornell in 1956, renaming it the Tompkins County Airport, airlines servicing Ithaca have increased. The airport now includes Allegheny, Air Midwest, and Trans States, all of which are US Airways Express commuters. Ithaca has gone through a number of steps to reach where we are now and there’s a continuous strong market for aviation in Tompkins County. The Ithaca Tompkins Regional Airport is fully functional during the winter, has security systems up to date, making it a competitive option in the area, and even has options for flying lessons with the East Hill Flying Club. Learn more about learning to fly here. ITH is a progressive airport and connects communities and the people of the town of Ithaca and surrounding cities. The future of aviation In Ithaca has a lot of potential for continuous development for years to come.